October is here, bringing us chilly winds with a hint of mystery and magic. 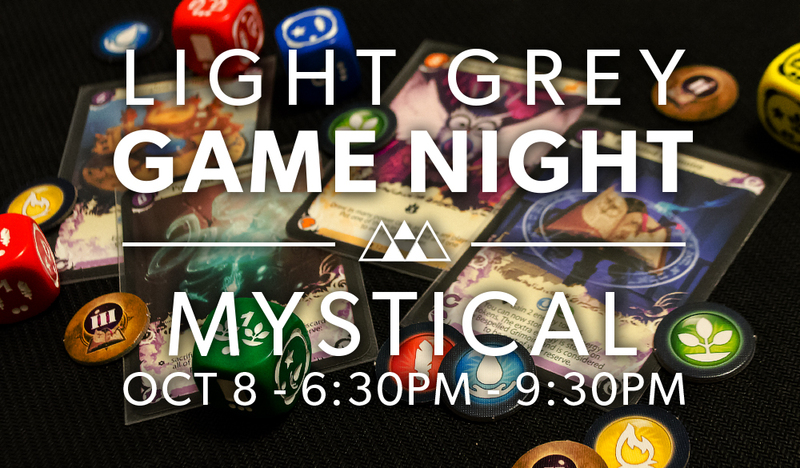 If you've got the urge to dabble in something a bit more arcane then usual, it must be time for another Light Grey Game Night! So mark your calendar for Thursday, October 8th from 6:30 - 9:30 pm! As you might remember, we're attaching a theme to each night to help people narrow down what games they might want to bring (although you're still welcome to bring whatever you'd like!). This week's theme is Mystical! Channel ancient energies to terraform lands in Terra Mystica, watch as werewolves turn a group of villagers against each other in One Night Ultimate Werewolf, and race to discover lucrative potions and magical concoctions in Alchemists, among plenty of others! If you have a favorite boardgame, bring it!